Our names are Laura & Meaghan and we teach a grade 6 class at Rideau Public School! We have had such an amazing time with these students. We began the year with a few lessons on peer pressure and decision making before moving on to substance use and abuse. The students are SO smart and love to engage in critical thinking; from questioning the global trade system to complaining about government profits on cigarette tax! Last week we did presentation on all different drugs and their effects. Some of the groups did skits, some did PSAa, and some made raps! We just finished our last class today and they wrote letter to their '16 year old selves' about all the things they have learned this year. We hope that if they ever feel pressured in high school, they can open the letters and remember this class. 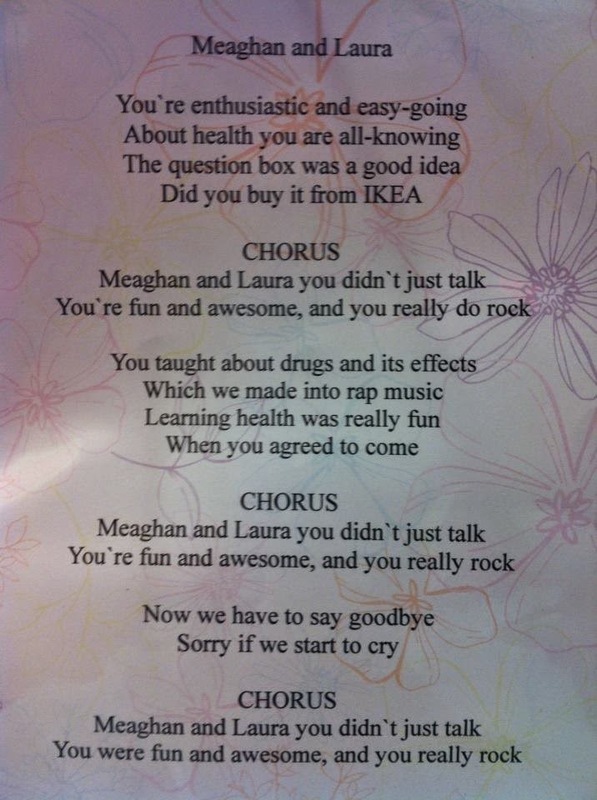 The students also wrote us a song to say goodbye!